The door slamming, the disgruntled looks, the surly responses. Wolf Young — aka Wolfie, biggest baddest werewolf in the middle Appalachians — had known accepting the job of pack leader would be difficult. He just hadn’t realized his archnemesis would be his own daughter. “I don’t see why you can’t just leave me alone!” Ember emoted. The preteen’s scent exuded pain, confusion, and sadness as she slipped out from under her father’s arm and rushed away into the night. What the heck? He’d only asked her if she needed any help with her homework. So Wolfie obeyed…but he didn’t have to like it. The next morning, the big, bad, overworked alpha blew off the pile of paperwork demanding his immediate attention and slipped outside in lupine form. Ember was only twelve years old, far too young to be drawn into a shifter mating dance. But if she was sneaking out to see boys, Wolfie intended to do something about it…something that involved ripping off arms and ensuring that certain males never touched his innocent offspring ever again. Except his only child’s scent trail didn’t lead in any such direction. Instead, Ember’s mossy aroma drew the pack leader across the village green and around a corner until he stopped in front of the community dining hall. His daughter had snuck away at midnight…to eat scrambled eggs? “Seen Ember around?” he asked the pack member in charge as he stalked in the open front door. 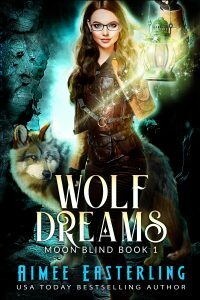 Wolfie’s voice was scratchy from his recent shift back to human form but his eyes didn’t miss a single detail as he scanned the shifters cooking, eating, and having an all-around good time. Nope, no daughter here. Wolfie knew nothing of the sort. His twelve-year-old daughter had moved out…and he hadn’t even gotten a memo? Sure, he’d been traveling a lot lately, trying to keep the neighboring packs from going crazy as they divided up formerly neutral territory among themselves. Meanwhile, his mate had been keeping the home fires burning in his absence…not so easy when Haven welcomed every lone werewolf who nosed around their borders despite the unfortunate tendency of the packless to rebel against even the slightest show of authority. So he and his spouse had both been distracted. But how could they have missed Ember getting so upset she willingly chose to abandon their loving home? A little time. Wolfie tried to accept the well-meant advice and put it to good use. But now that he’d noticed the chink in his family’s armor, that particular crack yawned wider by the moment until it turned into a gaping canyon separating him from the child who held his heart. He couldn’t let Ember slink off into the distance like a packless loner. He simply couldn’t. So the big, bad, worried alpha continued tracking his daughter through their vibrant village. At the community garden, Wolfie was informed that Ember had been helping weed and harvest for the last three weeks…and that he’d just missed her today. A trio of boys playing basketball barely escaped Wolfie’s wrath when they explained that the mossy scent coating one male’s arm emanated from Ember’s competitive streak rather than from any amorous advances. His daughter had won the game of Horse…and despite that athletic side trip she was still ten minutes ahead of her doting father. Wolfie wanted to be impressed by his daughter’s abilities for stealth when he lost her trail briefly in the woods. But, mostly, he was just growing more and more worried that the small splinter in his family’s happiness might actually turn out to be the source of an infected, gangrenous wound. Plus, there was a scent of blood on the air now. Just the barest hint, as if his daughter had scratched her arm up against a sharp stick and ignored the wound. Still, the aroma was enough to raise Wolfie’s ruff and bring a growl up his furry throat. No way was his daughter going to be wandering around injured on his watch. So he cheated. Pulling up the pack bond that provided information on every member of his clan, Wolfie tugged on his daughter’s thread…and soon ended up tracing her right back to his own front door. Ember was home. Wolfie slammed inside without worrying about scratched paint or bent hinges. It was past time to put this silliness to bed. Probably a good idea. Wolfie accepted a shirt and pants from his life partner, managing to drag on both while bounding toward his daughter’s room without pause. Opening her door without knocking, the placating words he’d managed to pull together on his descent from the mountain slipped right out of his mind as he was hit by a sensation that stopped him in his track — the overwhelming odor of large quantities of spilled blood. “Buttercup, where are you hurt?” Wolfie demanded, pulling his daughter off her bed and patting her down with terrified hands. During his long, useless chase through pack lands, how had he managed to miss the magnitude of Ember’s injury? How could he have thought this death wound was merely a scratch? Some alpha werewolf he was. “Ow, Dad, stop it!” the girl grumbled, wriggling out of his grasp. She moved easily, no signs of broken bones. And yet…was his daughter hunching over more than usual? Was she guarding an injured stomach from further attack? But no one answered. Father and daughter paused, cocked their heads in mirrored synchrony, then together lifted their chins to sniff at the air. Terra had left the building. Wolfie was on his own. Nag? Big, bad alpha werewolves didn’t nag. But, at the moment, Wolfie would have agreed to anything coming out of his daughter’s mouth. So he nodded slowly and reached forward to take one of her hands between both of his own. Thankfully, she allowed the touch. Still, Ember hesitated, turned her face away, shuffled her feet. The problem was evidently worse than he’d imagined. Could a twelve-year-old become pregnant? Had his usually pacific daughter started a war with another clan? Did she possess a gambling addiction that would draw mobsters to their door seeking immediate retribution? Not a problem, Wolfie decided. He’d simply unleash his inner wolf and tear into the opposition until they left his family alone. Easy peasy. And then the words came gushing out. “I’m starting my period, okay? It hurts, and it’s yucky, and the boys can all smell it, which is so embarrassing I think I’m gonna die.” She sniffed, a lone tear rolling down one cheek and dripping off her chin. And for one split second, she was his little girl again, waiting to be drawn into loving arms that could heal all ills. Then, rising, his daughter prepared to restart their earlier chase. Wolfie didn’t think the angry almost-woman would obey him, but she did. 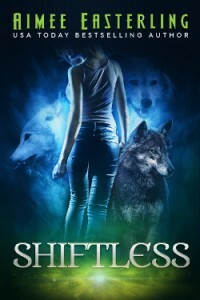 Pausing in the doorway, his little girl looked back with a scared, confused wolf barely hidden behind human eyes. “You can’t fix it, Dad,” she told him, angrily, coldly. But she wanted him to. Ember so badly wanted her father to snap his fingers and change things back to the way they’d always been that her body leaned subtly forward, her fingers moving through the air in search of a thread that would pull them bodily into their shared past. Well, that wasn’t happening. But Wolfie could instead propel them toward an even better future. Ember hesitated, weight shifting from foot to foot. He could tell she thought that he was scared of a little girl blood. She was pissed at him for changing the subject. But a chance to show off newfound skills — what competitive werewolf wouldn’t fall for such a trap? Which is how a big, bad alpha werewolf came to be covered in flour and cocoa when a delegation from the least friendly neighboring pack arrived for an unscheduled meet and greet. But Wolfie wasn’t worried. Male tempers he could handle. As long as Ember was smiling, all was right in his world. Want to see more of Ember and Wolfie? Keep reading with the Wolf Legacy series. Or maybe you’d like to share this story with your friends? Click the link below for easy commenting and sharing!